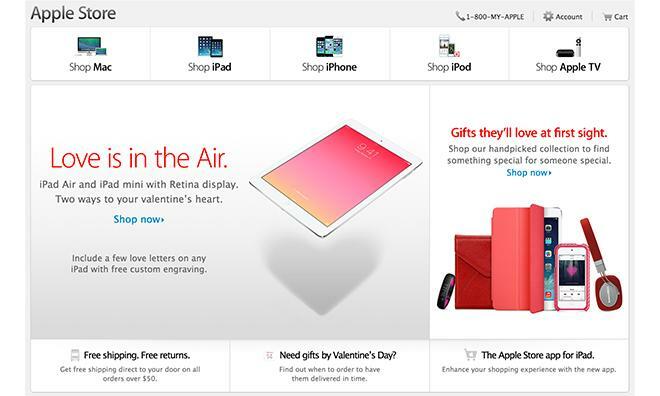 Aside from a few minor graphical revisions and new promotional text for products like the iPad Air ("Love is in the Air"), Apple's online storefront remains largely unchanged from its usual appearance. As with the Online Apple Store's special holiday redesign, Tuesday's Valentine's Day revamp also features a section where customers can plan out their purchases to ensure arrival by Feb. 14. For example, all iPhone orders must be placed by Feb. 5 to guarantee on-time arrival when using the free shipping option, while buyers planning to use next-day air can wait until Feb. 11. Similar deadlines are available for iPads, Macs, iPods and accessories. In addition to the website tweaks, Apple pushed out an update to its Apple Store app for iOS, which also features a Top Valentine's Gifts section.